In the Summer of 1906 Mahler was troubled by thoughts of failing powers. He decided to rest but on the first day of his holiday, whilst walking down to his composing hut , "On the threshold of my old workshop, the Spiritus Creator took hold of me and shook me and drove me on for the next eight weeks until my greatest work was done." This was the Eighth Symphony. Though ideas must have been germinating for longer, the actual composition took him about six weeks. At its legendary Munich premier, which didn't take place until four years later in 1910, the Eighth proved to be the triumph of his life. This was the most immediately accepted of all Mahler's works and, as he himself predicted to Willem Mengelberg, also the most easily understandable. Though even he may have underestimated the depths of meaning the work carries. Today many people have problems with the Eighth. 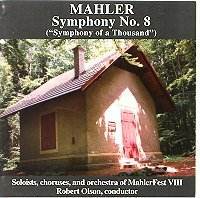 For some who enjoy everything else Mahler wrote, the Eighth is a "symphony too far". More used to Mahler's other works, some of today's listeners perhaps find its directness puzzling. It does seem to defy its place in Mahler's output, a feeling the audience of 1910, much less used to Mahler's other works, would not have had. If we're going to come to terms with it we should start by seeing it as the culmination of a particular genre in his output that began with "Das Klagende Lied" and continued in the later parts of the Second and Third Symphonies. Here he diverges radically from even his idea of basic symphonic scheme and we must see this strand of his work as representative of a specific "anthology technique" in which dramatic cantata, orchestral song, opera, passion and sacred oratorio become gathered together under the broadest of umbrellas. Also, since this is Mahler, that trait in his work of "significant recall" from his own works must also become part of the technique of which the Eighth is culmination. It's scored for huge a orchestra (including quadruple winds with eight horns, as well as mandolin and harmonium), off-stage brass of four trumpets and three trombones, eight soloists, a double choir, a boys choir and concert organ. In fact, at its first performance, the impresario who mounted Mahler's "Barnum and Bailey" work (Mahler's epithet) advertised it as "The Symphony of A Thousand" owing to the fact that one thousand performers took part. Do note, however, that Mahler himself never sanctioned the title you often see on record covers and concert programmes. 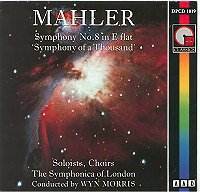 The Eighth is at base a statement of Mahler's personal aspirations: a belief in the ability of the inspired spirit to lift mankind to the highest plain of achievement through Love in all its aspects and embodied specifically in "The Eternal Feminine" which, for Mahler, meant his wife Alma to whom the work is dedicated. Within that scheme there are a whole cluster of other interconnecting ideas to do with faith, belief and theology which find resonance in the texts chosen and the way they compare and contrast. Any serious study of this work must therefore also include a close examination of these. Part I is a tight symphonic setting of the Latin Hymn "Veni Creator Spiritus". Part II a more rhapsodic setting of the final part of Goethe's "Faust". These two texts fuse religion and humanism together, with Faust symbolising mankind redeemed from wrongdoing through Love. In that sense Part II answers Part I both philosophically and also musically since there are thematic links to be found. 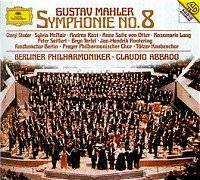 The Eighth is also Mahler in "public mode" in the same way as Britten in the War Requiem. As such, the Eighth is also like the Second in that it benefits from being heard "live" or in "live" recordings and this has certainly been my experience in listening to so many versions for this survey. Let me also draw your attention to a recording contained in the expensive multi-disc box released by the New York Philharmonic entitled "The Mahler Broadcasts". To represent the Eighth a 1950 account from Carnegie Hall conducted by Leopold Stokowski, who had conducted the work's American premier in 1916, was chosen. I think this glowing performance can claim to be the earliest commercially available recording of all since a "pirate" version on two five-inch "floppy" gramophone discs was in circulation soon after. It can be heard singly in a slightly inferior transfer on Music and Arts, but the "Mahler Broadcast" box version is so superior in sound it demands separate release. I must also mention a recording of a performance from the year after Stokowski's, this time from Vienna, where the conductor of the massed forces of the Vienna Festival of 1951 is that great character Hermann Scherchen. This was never released at the time and lay in an archive until the late 1980s so doesn't fit into the recording history like the others, but its place in the performing history must be secure. However, it's one for the connoisseurs since the recorded sound is difficult, the performance eccentric (as ever from this conductor), and the performance is laced with fluffs. 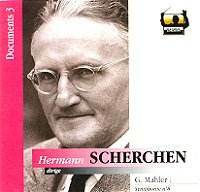 For students of Mahler performing history, though, and for admirers of Scherchen, it should be snapped up, especially since it manages to sit on one CD even though the running time exceeds eighty minutes. These three recordings take us back to a past era and a time when Mahler's music was still a novelty for many, but also to a time when performing practices still carried with them an echo of what they must have sounded like under the composer at that glittering, celebrity-littered Munich premier in the Summer of 1910. Surely one of the first "last hurrahs" of pre World War One Europe. In early 1959 Londoners were treated to a performance of the Eighth at the Royal Albert Hall that went into legend. This was conducted by Jascha Horenstein, featured the London Symphony Orchestra, most of the choirs in London, and was mounted by the BBC. It's been said that this was the event, the remarkable background to which is related in the liner notes, that began the Mahler boom in Britain. There's plenty of atmosphere conveyed by the recording, now at last officially and splendidly restored on BBC Legends (BBCL 4001-7), with a general sound picture with no distortion that allows for a surprising amount of hall acoustic and the feeling you have a good seat back in the hall. Only one stereo microphone was used high in the roof so, though there is a feeling of stereo spread, there is little in the way of precise directional characteristics except in the off-stage brass which appear to come from high up and to the extreme right. I find the balance near ideal for this work. The impression of "going for it" is apparent right through the performance. The orchestra is inspired and the choirs sing their hearts out. In Part I Horenstein is broader than Bernstein seven years later with many of the same musicians but his choice of tempo is balanced within his philosophy of what it is to conduct a work like this. One of Horenstein's most striking fingerprints was an ability to pick one overall tempo to suit an entire piece which also allows for the right degree of expression in those parts that need them. As if he has the span in his head before it starts. For me his less "impetuous" account of Part I creates a unique excitement and power because it's built inexorably as the piece progresses. A tidal wave by the end that stays in the mind because it starts from the depths and is only varied to extents within the tolerance of the whole. A big test is midway through Part I at bar 262, "Accende lumen sensibus". It's clear from what few notes Mahler left that this huge central section is of crucial importance to the entire work. The arrival of the chorus is ushered in by the horns "bells up" and roaring out one of the crucial opening ideas. First, this creates a theatrical entry for the choir's shout of "Ah.....CENde". Second, this theme on horns will recur through the whole symphony and therefore form a link between "Veni Creator" and "Accende lumen" in Part I as principal engine for Aspiration. Then, later, in its appearances in Part II, for Redemption and so linking the two Parts of the work. Therefore the arrival and execution of "Accende lumen sensibus" must be one of the highlights of the work and under Horenstein it certainly is. With his choice of overall tempo he doesn't need to slam on the breaks for the preparatory horns as there is by then enough forward momentum built up to lift the chorus and push it forwards. Mahler then helps soon after. Notice how at the second statement of "Accende lumen sensibus" Mahler leaves out any reprise of the horn introduction and the result is an inner dynamic built into the music that pitches us forward with no need for extra emphasis by the conductor. 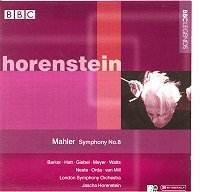 All Horenstein has to do is hang on to his established tempo and he inherits what Mahler has given him. It makes this moment even more telling because the power comes out of the music and isn't imposed upon it. When the chorus finally unwinds to land on the recapitulation of "Veni creator spiritus" at figure 63 there's still no need for Horenstein to slow down and conductors like Bernstein and Tennstedt do. He has managed to give us grandeur and excitement and allowed each crucial theme to have its effect. The arrival of the recapitulation has an inevitability rather than a sense of shock which Mahler surely intended it to have. I must also say the volume of sound this recording produces at this moment is overwhelming. Often the coda is spoiled by the conductor increasing his tempo and rushing the end with the result you lose the sense of all the themes being gathered together. This is not the case here. there are clear links to be made from this cluster of ideas to the Third Symphony's fifth movement with the children singing of Morning Bells, and to the Fourth Symphony's last movement of the child's view of heaven. There is a whole network of ideas buried within this remarkable passage that tells us so much of what Mahler is trying to do in this work. Far too many to go into here but which demand closer attention. At bar 639, Doctor Marianus's praise of Mater Gloriosa (the Eternal Feminine who represents the Love by which Faust will be redeemed) is the "Prize Song" of the work and is suitably enraptured, holding no fears for Kenneth Neate. And what a build-up he gives Mater Gloriosa. Note the wonderful string accompaniment. Anyone who thinks Horenstein a "sober" conductor should listen to this as Mater Gloriosa's arrival at bar 758 can too often sound sugary. The sound Mahler asks for - strings with harmonium and harp - is unique and saved from bathos by Horenstein's simple and direct treatment of it. "Very flowing, almost hurried. Like a whisper" is Mahler's marking for the trio of three women in deep sin and Horenstein observes this impressively. In fact, I was reminded of the Three Boys in The Magic Flute and this passage shows Horenstein's light touch, carried forward to the entry of the mandolin at bar 1093 and the song of The Penitent (Gretchen) where Horenstein gets his player to point the rhythm beautifully. There is a dance-like quality to many these passages, in fact. I recall an interview with Horenstein when he spoke of hearing as a young man "Das Lied Von der Erde" for the first time and being more fascinated by the presence of a mandolin on the platform than of anything else that he heard that night. By the arrival of "Blicket Auf" at bar 1277 (Kenneth Neate again magnificent) I feel I'm in the hall with these players, feeling with them the strain of presenting this extraordinary work in what must have been a test of endurance. The balancing of the parts in the remarkable section leading to the slow transition with harmonium, celeste, piano and harps to usher in the Chorus Mysticus is masterly. By now it's almost as if the performance has moved into an even higher sphere. So to the Chorus Mysticus and we are almost home. In the course of this chorus, and the work's postlude, Mahler ties together the "Accende Lumen", "Veni Creator" and "Mater Gloriosa" themes to signify journey's end and so does Horenstein. But to say he does only that is to sell the Chorus Mysticus in this recording short. The astonishing crescendo of the final chorus, as conducted by Horenstein, from whispered quiet at the beginning to astounding mass at the close, has always been the greatest glory of this performance, apparent even on the inferior versions we had to put up with in the past. The way he holds on to his very slow tempo, building inexorably as the music rises, is beyond belief. When the final orchestral postlude arrives, with the "Veni Creator" theme from the first part exultant, the power is almost visceral and the recording copes with everything without strain: cymbals, tam-tam, organ and off-stage brass raining down on us. The eruption of cheering as soon as the work ends signifies a whole lot more than just the end of a concert. Here was an experience which I'm sure everyone present would not have missed living through and it's one which I earnestly advise all of you not to miss either. 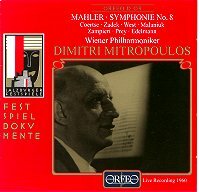 Dimitri Mitropoulos was a Mahler pioneer too. He gave the first American performance of the Sixth Symphony as late as 1947, shared the centenary cycle in New York with Bernstein and Walter, and left a string of radio archive recordings across the world that are only now receiving official release. The "live" Salzburg Festival version from 1960 sat with the Flipse for some years as all Mahlerites could get of the Eighth to take home on LP. Now it's available officially on Orfeo (C 519 992 B). Mitropoulos's Mahler was expressive, dramatic and based on a formidable knowledge of the scores. It was also always heard best in the concert hall, as we found with his magnificent Sixth Symphony from New York. There are downsides. Imperfections in playing have to be tolerated and, as in the case of all those pioneering recordings of the Eighth, deficiencies in sound too. But these are sacrifices I'm willing to accept insofar as they don't stand in the way of quality music making. But be warned, this mono recording may try the patience of those for whom perfection of sound is a necessity. Everything is clear but there is some distortion at certain higher frequencies and a slight "fizz" on the violins. There are also one or two odd balances and an uncredited appearance by an aeroplane over the Felsenreitschule during the soft chorus passage at the start of Part II. The puny organ you hear first is not a promising start either. Neither is Mitropoulos's chosen tempo, some way from the "Allegro Impetuoso" Mahler asks for. The whole approach through the setting of "Veni Creator Spiritus" is to grandeur and solidity. An approach Horenstein triumphantly justified by driving on a touch more and Mitropoulos's performance illustrates what can be lost if some heavy-footedness is allowed to drag proceedings back. One benefit is that passages like the short orchestral interlude prior to "Infirma nostri corporis" emerge with good detailing and those where the soloists are singing together also allow us to hear every vocal line. At the key passage midway through Part I, "Accende lumin sensibus", Mahler's instruction to the horns to lift their bells for the great blast heralding the choir's double fugue indicates a thrilling of the blood in the score, but there are performances that do that more than Mitropoulos's. However, as the double fugue progresses, a sense of cumulative momentum is built up. The chorus is not as large as it might be but these are excellent singers. By the arrival of the closing passage Mitropoulos's steadiness has so much become the norm I at least had become adjusted and found the coda as thrilling as ever, even though the timpani thumping out one of the movement's main themes were a trifle stodgy. Good to hear Mitropoulos doesn't rush the ending either, hanging on to the juggernaut until the final note. Not a great reading of Part I, but a distinguished one for all that. If I had reservations in Part I these are made up for by the performance of Part II which alone justifies this release's importance. Here Mitropoulos's ability to bend with the music delivers a deeply moving experience, a contrast to the first part which may be what Mitropoulos was aiming for. The "Poco adagio" is warm and expressive with passionate outbursts at key moments crowned by the horns of the Vienna Philharmonic which will be such a feature. Then, as each soloist appears, the impressive quality of all of them is confirmed. Hermann Prey as Pater Ecstaticus is lyrical and reflective, Otto Edelmann as Pater Profundus overcomes intonation problems to emerge tough, powerful and commanding, and Giuseppe Zampieri's heroic tenor flies above his two key contributions with heart-stopping emotion even at the tempo Mitropoulos demands for Doctor Marianus's praise of the Queen of Heaven. This passage is superbly prepared for by the choruses who give the impression of coming from higher spheres. The heralded appearance of the Mater Gloriosa is serenaded by the strings of Vienna Philharmonic with phrasing which only they could produce - portamenti like a great singer would deliver. "Blicket Auf" penetrates to the core of Mahler's setting of "Faust" sending shivers down the spine as the end is in sight. As so often in this performance of Part II, there's no hint of episodic structure. The women soloists are no less impressive and I was particularly taken with the trio at "Die du grosen Sunderinnen" where Mitropoulos's reining back of the tempo and the forward balance of the soprano and two contraltos allows us to hear every vocal line. The closing pages of the maintain the long line Mitropoulos established as far back as Part I and in some ways justify by balancing his steady approach there. The sheer power built up carries all before it, crowning this great performance with a rare feeling of joy and release. Leonard Bernstein's first recording is now on Sony (SM2K61837) could be said to be the first of the "modern era" Mahler Eighths on record. It was studio-made at Walthamstow Town Hall in London following two fraught "live" performances at the Royal Albert Hall during 1966. The LSO are the orchestra, along with a host of British choirs, professional and amateur. Firstly it has to be said that the sound is showing its age. It was never "demonstration" in the first place and, with the huge forces involved, a certain standard of sound is needed. There's a tendency here, especially in the thickly-scored sections, for the sound to become pinched and distorted. A really great performance can override these but Bernstein's is some way short of that. He is ever the "edge-of-the-seat" but expressive and subjective Mahlerian in this work and he seems to be trying to recapture in the studio the excitement and drama of the "live" experience. I praise him for that even though I find the results variable. What he does in Part I is take the music by the scruff of its neck and shake it rigorously. The opening is marked "Allegro impetuoso" and Bernstein certainly manages to give that impression, but his subsequent changes of tempi, certainly allowed for in the score, always come over too extreme so this is a "stop-go" affair where the joins show. The first passage for soloists, "Imple superna gratia" is too slow, as is the early short orchestral passage. This feeling persists right the way through Part I and, for me, seriously gets in the way of the developing drama, spoiling momentum that must be built up as the piece progresses. The great central double fugue, beginning with the choral shout at "Accende lumen sensibius", is too rushed for us to hear everything clearly. Also the choruses aren't given enough opportunity to get all the words across which, with this recorded balance, is never going to be easy anyway. The visceral power this passage has needs more than just a high speed to make its effect. In fact, "hysterical" is more the word that comes to mind in Bernstein's superficially exciting, but ultimately unsatisfying, account. The reprise of the opening "Veni creator spiritus" certainly needs to be broadened, as Bernstein does, but the effect is just bombastic and crude. Not the grandeur this passage can deliver, and the close of the movement, like the central double fugue, is simply rushed. The more episodic Part II suits Bernstein's general approach much better. In fact, there's something of the operatic to the way Bernstein interprets Mahler's setting of Goethe's Faust Part II. The orchestral Prelude finds the LSO on fine form, though there are times where I find Bernstein's warmth innocuous in music meant to depict "Mountainous ravines, forest, great crags and wilderness." But he certainly finds the drama in it. The first choral entry of the Anchorites has the right degree of raptness, however, especially at the end prior to the entry of Pater Ecstaticus and Pater Profundis, whose contributions are urgent. That is until Pater Profundis describes the storms where Bernstein pushes too much. There's a fine team of soloists on this recording, though I feel the women sound too much alike, especially unfortunate in the long passage where three of them sing together. The choruses have their sticky moments, though. Not least the Angels at "Gerettet is das edle Glied", where some more rehearsal or a retake might have helped with ensemble. Bernstein tries for "lift" here, but the chorus don't seem quite ready for take-off. Doctor Marianus is John Mitchinson and he's the best of the singers. His great entry praising the Queen of Heaven at "Hochste Herrscherin der Welt" is prepared for by some very child-like voices in the choir but I don't believe Bernstein does any more than skate over the surface of this crucial passage leading me to wonder how far he had delved into the words his singers are given. But no complaints at Mitchinson's central role in this section where he brings every ounce of his experience and is very moving - as he is also later in his other great solo "Blicket auf", parts of which he even manages to darken. A pity Bernstein again rushes at the end when the chorus joins. The arrival of the Mater Gloriosa, the lovely passage for strings, harp and harmonium, finds Bernstein at his most syrupy. How to play this passage must tax the minds of the best conductors. Bernstein's solution is at least unashamedly romantic, Mascagni-like, and does stay in the mind. He closes Part II with a performance of the "Chorus Mysticus" and subsequent peroration and coda that sums up his approach overall well. The recording lets him down in that the sheer volume of sound threatens to overload, but Bernstein maintains a fine sharpness of focus which only wants for the kind of inner grandeur missing from his account of the end of Part I. Bernstein's recording is a good example of the inspirational, "on the wing", "moment-to-moment" approach that can be made in this work. Parts of it come off, parts of it don't, and you can certainly cherish it for the former if you can overlook the latter. However, I think something more consistent right through will satisfy over the longer period. This is, after all, what we buy recordings for. Another recording straight off the shelf marked "Visionary" (sub section "Interventionist") is by Klaus Tennstedt teamed with London Philharmonic forces. Aspects of Tennstedt's overall approach mirror Bernstein's and his studio recording on EMI sometimes comes out top in recommendations. However, the Tennstedt recording is ruled out for me because of what I consider a fatal flaw: the size of the chorus. Mahler specifies double chorus and all other evidence, not least the first performance, suggests as many singers as possible should be involved, something most recordings take as given. Why then is Tennstedt's studio recording made with what is obviously a single choir, namely the London Philharmonic ? They sing well, but that isn't the point. There needs to be more of them to convey what Mahler wanted. More regrettably I have to exclude Giuseppe Sinopoli's studio recording on DG with Philharmonia forces for much the same reason. I regret this much more because Sinopoli's reading is a fine one: passionate and thrusting but without the fierceness that, for me, disfigures much of Solti's version dealt with below. Again only a single choir is used by Sinopoli and the effect is almost the same as with Tennstedt. In both cases, and especially with Sinopoli, the engineers try to minimise the lack of personnel by recessing the choir to make them seem bigger. The effect of this is to make the words they sing much less audible. In Sinopoli's recording, for example, the first "Ah" on "Accende lumen sensibus" during Part I is hardly audible. (If you really want to hear how this thrilling entry ought to sound, go back to the old Flipse recording which probably has more choristers than any other.) I feel strongly about the size of the choruses and the question I would ask those responsible for the Tennstedt especially is: Would it have occurred to you to record Mahler's Second Symphony with half the normal-sized choir ? Because recording the Eighth with the same sized choir as the Second is effectively to treat Mahler's wishes with the same apparent contempt. The reply might be that in the studio things are different. My reply would be that other studio recordings manage to reproduce the requisite size of choir with distinction. One of these is my next consideration, one of the most famous recordings of the work in the catalogue. Sir Georg Solti's 1971 recording on Decca has been a market leader since it first appeared. It is now available in Decca's latest "Legends" re-mastering (4609722). For many this has always been the version to have, regularly topping the list of recommendations. It was recorded in the Sofiensaal in Vienna but the orchestra is the Chicago Symphony who were then on European tour and the sessions were crammed into what must have been a tight schedule. You would never know it from the excellence of the results, though you might argue the character of the performance might have been influenced by the need to get in and get on with things. But then again there is so much here that chimes in with the rest of Solti's Mahler. I've never been a particular admirer of him in this composer. 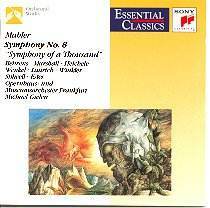 But, in spite of the reservations I'm going to spell out, I reckon this his most successful Mahler recording. He delivers all the thrust and "impetuoso" you could possibly want from the first note on. Indeed, he delivers both right through Part I even when I don't think he should. There are passages where he relaxes a little, the early "Imple superna gratia" for example, but generally the undercurrent is to press onwards. The soloists are well balanced and it will very soon emerge that this recording boasts what I believe the best team of all. The choruses are excellent too, as can be heard in "Infirma nostri" which is matched by a real sense of tension and foreboding from Solti. The playing of the orchestra in the short orchestral passage before this choral passage also tells us we are in for a treat in that department, but I will come to have serious misgivings about the appropriateness of the orchestral timbre the Chicago orchestra offers overall. Right the way through, in spite of their matchless virtuosity and thrilling drive, there is a hard-edged quality to the brass and strings I find all too wrong in Mahler and which, for me, always disfigured Solti's recordings with them. In the Bernstein recording I found the great central double fugue at "Accende lumen sensibus" too fast. Solti is no slouch here either, but such is the excellence of his orchestra and choruses he pulls off this passage at this speed with distinction. This is a roller-coaster ride that will leave you breathless. Grandeur to be heard in Horenstein and Abbado in this passage is largely lost, but at least Solti takes a specific view and succeeds. As he does also in the close of Part I where the dynamism, a word that sums up Solti's whole approach to this symphony, rounds off an experience no lover of this work ought to miss, even though I'm still left, as I will be at the end of the whole work under Solti, feeling short-changed. But more of that later. The orchestra plays the prelude to Part II wonderfully. Though I remain in my belief that their sharp sound is more suited to Bartok than Mahler, brass especially. No doubting its technical brilliance, but the Vienna Philharmonic should have been sitting where they were. I did like the way the whispered choral passage that steals in afterwards comes over so seamless and in such fine balance, though. An example, I suppose, of where studio recording can score over "live" recording. Especially when, as here, no attempt is made to replicate concert hall balance. I mentioned before how I believe this recording boasts the best solo team. Pater Ecstaticus is John Shirley-Quirk whose perfect enunciation and rapture are a pure joy. Pater Profundis is Martti Talvela who vividly paints the landscapes with Solti in splendid support, the orchestra recalling the first movement of the Third Symphony through vivid bass shudders and penetrating woodwind trills. (High voltage stuff at "Oh Gott ! beschwichtige die Gedanken".) Doctor Marianus, the work's star part, boasts Rene Kollo on top form, especially in "Blicket auf" which is a burst of pure ecstasy at what is to come. The women are no less fine and so sad to recall that three of them - Helen Watts, Lucia Popp and Arleen Auger - are no longer with us. Listen to Heather Harper's top line at "Gloria patri Domini" in Part I for a moment of pure magic. The closing pages see the brass of the Chicago Symphony towering as always. 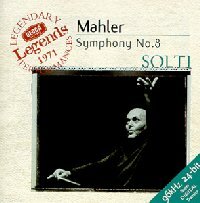 In later performances I have heard Solti give of this symphony he drove the end far too much. But hear he's more alive to the grandeur of Mahler's vision and it sums up his whole approach well - dynamic, extravagant, technically rock solid. I did mention earlier about feeling "short changed" at the end. I don't refer to the performance itself, quite the opposite. It's the nature of the performance as described that always stays in my mind, so that what I miss is any lasting impression of the music of Gustav Mahler as represented in this symphony. Claudio Abbado's DG recording (445 843-2) was made "live" with the Berlin Philharmonic but, I suspect, contains some "patching" to cope with performance fluffs and any audience problems. Nevertheless, there's much about the finished result that gives the feel of a concert performance. In many ways Abbado is the opposite of Solti. Part I opens with a welcome broadness and a sense of epic reach without the Allegro momentum being impeded in any way. A real middle course between Solti's dynamic charge and Mitropoulos's stately procession. Another aspect, noticeable even in the first few pages, is how clear and revealing the sound picture is with every strand audible but all in excellent perspective and allowing us to benefit from Abbado's stunning ear for detail. There is an especially nice balance for "Infirma nostri" where the orchestra with solo violin finds a strange, darker tinge to the music that is arresting. And have you ever heard such a low bell as this one ? The BPO percussionist must have hunted high and low (very !) for this one. I also admire the way, right through Part I, Abbado seems ready to explore other more reflective and lyrical aspects. But don't think for one moment Abbado doesn't deliver power and drive. "Accende lumen sensibus" and the closing pages satisfy completely and in the way they don't under Solti. The chorus is just large enough and they are balanced better than in the Sinopoli so they suffice. Here it's the music that stays in your mind rather than the performance and the Berlin Philharmonic can match the Chicago Symphony's power with a more substantial, idiomatic sound. Abbado's choirs are every bit as well-drilled and responsive as Solti's also. At the end of Part I, Abbado broadens slightly, again every strand clear and the extra brass are thrilling. The organ might be more in the background than some at this point but it's a small gripe. In the orchestral prelude to Part II there's the most withdrawn and "inner" playing at the very start than any I have heard. Later in this section, Abbado gets playing of wonderful depth from his players without for one moment forgetting what is being described in the music is a very unforgiving landscape into which the whispered Anchorites merge perfectly with the excellent balance. Distinguished among the choirs are the boys from whom we hear every word and notice also Abbado's ability to suggest a real playfulness in the passages with bells that lie at the heart of this work The soloists may not be as fine as Solti's, but they are a good and pleasing group all the same. Cheryl Studer is no match for Lucia Popp as Penitent, but who is ? But Bryn Terfel is in fine voice as Pater Ecstaticus and while Peter Seiffert has a slightly lighter voice than Rene Kollo, his Doctor Marianus is still memorable and moving. "Jungfrau, rein in schonsten Sinne", praising the Mater Gloriosa, is exalted with some lovely solo violin work accompanying and the women's choir coming as if from high up. When the Mater Gloriosa actually does fly into view it's interesting how Abbado seems to underplay the strings and harmonium passage itself. It proves that in this recording Abbado knows when to leave well alone: the concept of "less is more" never more appropriate since this passage can sound very saccharine in other hands where here it sounds unpretentious and thoroughly appropriate. There are few recordings that manage to show so many aspects of this great work yet still deliver a coherent, symphonic experience as Abbado's and for that, and many other aspects, I rate this version very highly. In his recording of the Second Symphony I noted how Abbado keeps sharp focus for the "Auferstehn" hymn at the close. Interestingly for this work, he delivers one of the most exultant endings on record. There are certainly few recordings that allow you to hear everything so well. Though, again, the organ is a poor relation at the end and this must have been a specific decision and not one that will meet with universal approval. Apart from that, I think this recording is the modern one that comes closest to Horenstein's conception and must be counted a leading contender, particularly with such superb sound and playing. Integrity matched to genuine fantasy is what you take away from this. A fascinating and illuminating balance that I find very impressive. A recording currently unavailable is one made in 1971 by Wyn Morris with an orchestra made up the best London freelancers then available and some excellent choirs of the right number. The studio sessions followed two Royal Albert Hall performances and this is one of the few recordings of this work made in studio that does give the impression of "live" performance, probably due to the practice of recording in long takes. It first appeared on LPs bought by mail order, but there was a CD release on IMP Pickwick (DPCD 1019) where it was unaccountably divided equally over two necessitating a disc change half way through Part II. But I'm prepared to put up with this on account of a performance that defies classification. Wyn Morris is expansive, substantial, sonorous and, in the opening passages of Part II, downright perverse. And yet it works. The massed choruses in Part I have a fervent blaze that always carries me away, the interpretation has monumental grandeur like Donald Wolfit reciting Shakespeare, and though there are some lapses in ensemble, especially in Part II, there are also passages Morris does better than anyone. There are some good soloists too, including our old friend John Mitchinson. This is definitely not a recording for the everyday, but it's certainly one that deserves to be back in the catalogue, hopefully in a better transfer and with one Part per disc. Next another unique recording, one made "live" in Boulder, Colorado at the Mahlerfest of 1995. This can be obtained from the Mahlerfest's own web site and is well worth investigating. The pro, semi-pro and amateur forces that gather in that city every year for one performance here give an account that, whilst lacking in the elan and polish the big professional ensembles can muster for big-name labels, makes up in sheer commitment and dedication. The sound is a "conductor's balance" in that you hear everything in proportion. Some may find the sound rather "boxy" at times, but you do soon adjust. I could imagine some disliking the forward projection of the brass also, but that didn't bother me too much and I noticed some details, especially in the lower brass, I hadn't noticed before. I also thought the organ was well balanced, not just when the instrument is going full out but when there is a satisfying, rock-hard pedal underlying the texture. The soloists are well placed and that is often not the case. Mater Gloriosa in Part II, for example, is notable for sounding not just far away but also high up. I was disappointed with the balancing of the boys in Part II, though. They sing well but they fade from the texture. I have heard recordings where some of the "great" orchestras have sounded complacent but this is not a criticism that could be levelled at the Mahlerfest Orchestra even though they do have their "off" moments. Playing well also means communicating and they do that so well. The choruses are splendid too. I could make out every word in loud and soft passages and there are some thrilling entries, notably "Accende lumen sensibus". Robert Olson's pacing of Part I was splendid. He seems to have taken care to pick a tempo that gives sufficient thrust but also allows lyricism to come through. The "conductor's balance" helps in the first choral entry in Part II. Too often this can sound like a few grunts coming from behind the orchestra, but I could hear what they were singing this time. I liked the tempo for the orchestral introduction as well. Perhaps the orchestra sounded a little undernourished, but it hardly mattered. There's a fine logic behind Olson's vision of Part II and an antidote to the more operatic approach: focussed and clear-sighted, mind on the end at all times. Take the interlude of Mater Gloriosa rising - strings, harp and harmonium. The operatic approach, as with Bernstein, can turn this into something out of Mascagni. Olson's sharpness of focus fits this as a piece in the enfolding puzzle, leading us onward. In the conclusion Olson doesn't disappoint either. I was struck by its dignity. An odd word to use, but that's the word that comes to mind. Faust's redemption as enacted here is a matter of honour: by those who save him, honour by the triumph of his own basic goodness in spite of his fatal pact, the honour that is in the concept that goodness triumphs not by superior force but by the simple fact of being human. I have heard a performance where the conductor drags the brass perorations out, turning the whole matter into one of superior force triumphing over lesser force. Olson shows restraint here and the result satisfies on a deeper level. The players might have "lost their lips" a bit by then but even that adds to the sense of achievement hard one and I applaud them all for it. This is a recording I advise you to investigate as a supplement to the mainstream versions. It has some virtues missing in others, not least the unmistakable quest of its performers to reach into themselves in order to go beyond themselves. For those on the most limited budgets let me draw attention to a single disc, bargain-priced recording by Michael Gielen recorded "live" in Frankfurt in 1981 on Sony (SBK 48 281). Gielen is always an interesting Mahlerian, stressing the more modern aspects of his work, "head" rather than "heart", which might not be the best approach to the Eighth when compared with other, more exalted readings. But it certainly has its place. All the same, if this is all you can afford you could do a lot worse than this. Bernard Haitink's version, for example, also at around the same price on Phillips, should be avoided as just dull which is no mean feat in this work. Gielen's version also has the benefit of being recorded "live" and there's a sense of occasion to be had from his quite brisk, direct, open-faced reading I rather like as a supplement to my main choices. There are other recordings available, of course. Lorin Maazel on Sony seems to be deprived of all sense of direction, as if he "phoned in" his contribution from his hotel bedroom whilst still in his silk pyjamas. Robert Shaw on Telarc seems out of his depth in Mahler, predictably well-trained though his choruses are. Leif Segerstam on Chandos is not quite as eccentric in terms of rubato and mannerism as he was in his, at times, grotesque recording of the Second Symphony. But after a few hearings any initial regard I had for his Eighth evaporated. Also I found, as in his Second Symphony, the large reverberation that surrounds the sound recording becomes tiring on the ear and I would love to hear his alibi for the tam-tam crescendi at the end. Rafael Kubelik's interesting DG reading should return to the catalogue as a single disc. At the moment you have to buy his entire cycle to get it and re-issued it would be an alternative bargain to Gielen. Kubelik was always one of the most rewarding of Mahlerians. Summing up, in the modern digital recordings I have the highest regard for Claudio Abbado's DG version and this is my best general recommendation taking in the best modern sound, performance and interpretation. A pity about the organ but it's, for me, a small point. I'll always retain a place in my affections for Wyn Morris too. Not to everyone's taste, not ideally recorded or played, but I believe that at enough times his is a version touched with genius. Sir Georg Solti will continue to dominate for those who like their Mahler Eighths more high octane, and Leonard Bernstein for those who like their hearts on the sleeves. However it should be obvious that, for me, Jascha Horenstein's version on BBC Legends is out on its own. If I was faced with the destruction of all the rest leaving only one, this is the one I would be satisfied with.